Just like IT routers connect hardware, SocketStation provides flexibility for connecting your real-time data to your processing tools. SocketStation logs and streams real-time data simultaneously to your management systems, archivers, interactive users, etc. Protocol plug-ins manage tricky connectivity centrally, so your users and apps can connect via plain old sockets. SocketStation's stream duplication helps you do more with your data, real-time. Your listeners receive the original raw bytes, or alternatively a more convenient translation, such as XML, JSON, etc. Log and stream to multiple management systems simultaneously. Underlying protocols are normalized to plain sockets, reducing listener integration costs. Your data may be accessed via endless protocols and APIs. SocketStation uses a plug-in architecture to scale its connectivity. A plug-in's job is simple: to start/stop feeding bytes to SocketStation. (It might also transform or enrich the original data.) Then SocketStation logs and streams the data to each listener. SocketStation may be useful if you've ever thought, "I need to..."
... interface to several different protocols. An alphabet soup of protocols (SSH, CORBA, Java/RMI, APIs, etc.) is a hurdle every time you consider a new use for your data. Imagine all your real-time data accessible via clean, plain sockets. ... feed more than one client at a time. Often, a data source only supports one connection at a time, either explicitly or indirectly (by affecting performance). Are you forced to choose one destination,	and deny all others? SocketStation's buffering and isolation techniques safely feed multiple listeners. Force your vendors to prove their worth in head-to-head trials using your real live data. SocketStation is your cut-over/fallback plan. Moving to a new data processing app is dangerous when you "flip the switch" that cuts off your old app. SocketStation helps you feed both apps until the new one is a success. ... centrally log raw data. Since SocketStation acts transparently, your data can be logged byte-for-byte, or as translated. 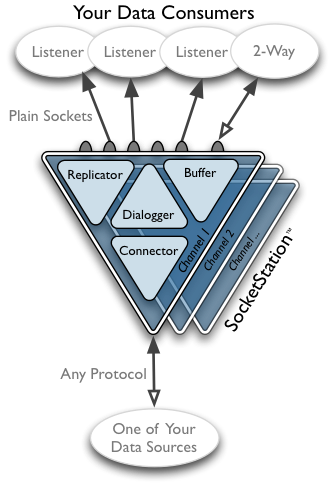 A dialogger runs scripted interactions: useful to automatically login to your data source, run commands, send keep-alive data, and cleanly terminate a session. Thanks for exploring SocketStation. Also consider an overview of its plug-ins, some screenshots of its web browser interface, and a case for data routers like SocketStation in general.